DIY nerve-operated limb prosthesis in the near future? So, I'm sure we've all seen the videos and articles, starting a few years back, about prosthetic arms able to be controlled with the mind. Of course, these are probably the best kind of prosthesis available, even if they're not quite as good as our default hardware currently. The only downside I can see is they're sometimes overly heavy (which will improve with time, assuming Moore isn't proved wrong any time soon) and their cost, which can be addressed in other ways. Of course, as you probably guessed, I'd be interested in making something with the same functionality. My knowledge of the software and medical fields are quite limited, so I don't expect to meet with much success, but I figured I'd talk to you lot and see what stumbling blocks you'd expect me to run into first. Would modified needle electrodes be safe for long term usage? I haven't been able to find much on what kind of nerve-to-sensor interface the experimental varieties use, but conventional methods of sensing motor-neuron activity seem straightforward enough. I wouldn't expect a touch-sensitive model for quite a while, considering how much smaller/more sensitive/more widely spread sensory neurons are. 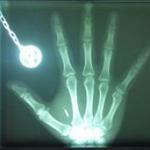 Would be funny to see people implanting m31s into prosthetic fingertips, but probably not gonna happen any time soon. Hi Ecadyst, I'm a bit short on time so I'll just give you a quick rundown. Moor's law doesn't apply to mechanics so don't get your hopes up for that. Current tech level of the DIY community is developing electrode output (not directly to nerves but just stimulating skin). There are integrated circuits targeting neural stimulation, they start at 300USD per piece. Reading circuits are a bit cheaper but far more difficult to use. Stainless surgical steel is a somewhat-ok material for long term implantation and even electrodes but it's not exactly the top of the line and not really the choice when you go for direct nerve interaction. Biggest roadblock would be to find a neurosurgeon willing to wire everything up. And I highly advise against DIY neurosurgery. So yeah, while it's theoretically possible to pull this off if you have a group of talented and dedicated engineers.... chances for success are still low and there are many intermediate steps to solve first. I've wanted a 3rd arm for as long as I can remember so this subject really interests me. I have never tried this but there are instructions to use an Arduino to read the nerve/muscle signals and control other things.